Most appropriate sealing material for use in internal combustion engines, corn pressers, hydraulic systems, thermo-hydraulic applications and food industry. Equivalent: - DONIT (TESNIT), FLEITALLIC, KLINGER, NOVUS, REINZ, ELRING, GARLOCK Etc. 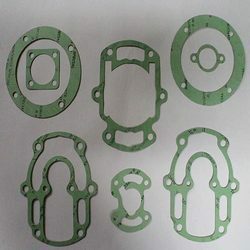 We have expertise in manufacturing of Non Asbestos Based Gaskets popularly known as Compressed Asbestos Free Fibre Gaskets, which is manufactured from ARAMID fiber blended with suitable heat resistant binders (NBR) and vulcanized into sheets of homogeneous compositions and uniform thickness. Looking for Asbestos Free Jointing ?